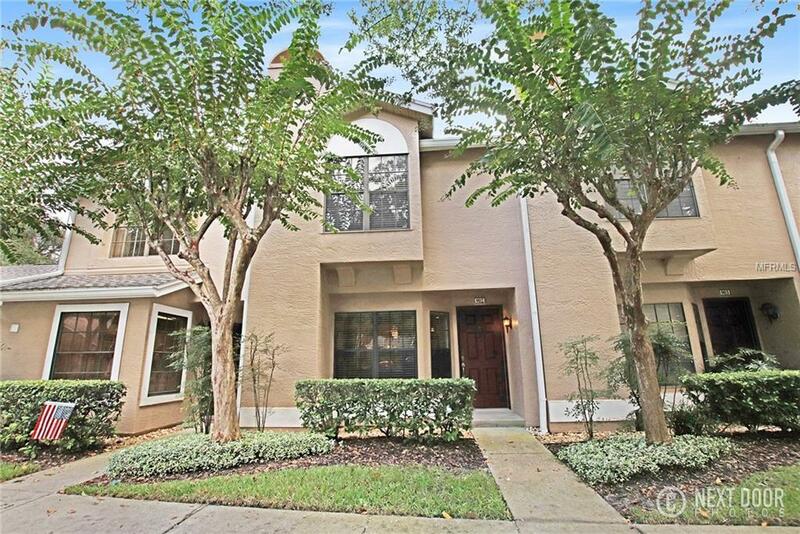 Beautifully updated townhome in the highly sought out area of Tampa Palms. This immaculate 1185 square foot home offers updated bathrooms and kitchen. The kitchen has granite countertops, all stainless steel appliances, and under cabinet lighting controlled by a dimmer. Gleaming wood floors throughout the first floor. Upstairs you will find two large bedrooms with attractively updated bathrooms attached, and great closet space in each. Travertine in foyer and bathrooms. Every detail was thought of with this one. Crown molding throughout, recessed lighting, high end finishes, and the screened in patio offers a view of gorgeous cypress trees. No need to worry about contractors and deadlines to update on your own. The work has been done for you. A perfect floorplan for a small family, a snowbird's winter getaway, or for a couple who has visitors. You won't find another townhome with such extensive upgrades. Close to I75, shopping, and restaurants. The community offers gated access, pool, clubhouse, playground, tennis courts, and park. You have got to see this one for yourself! Additional Lease Restrictions Please Verify With The Association Office On Site. Listing provided courtesy of Apex Brokerage Inc.